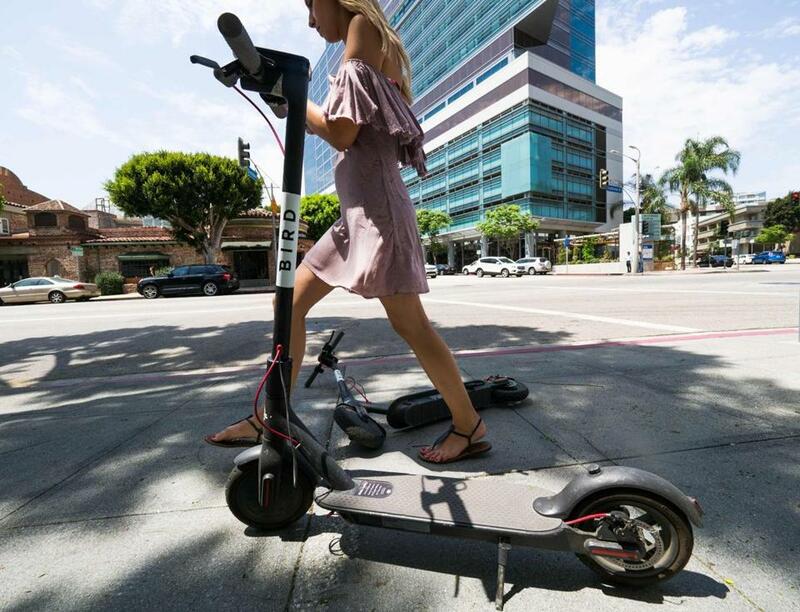 A pedestrian walked between two Bird dockless scooters in Los Angeles. It looks like Bird has ruffled some feathers. Cambridge officials said Tuesday that Bird — the electric scooter rental company that arrived unannounced in late July — should take its scooters off the city’s streets, at least until the proper permits are obtained. Cambridge delivered the news to Bird during a meeting between city officials and company executives Monday morning. As of Tuesday, however, Bird scooters were still available to users on streets around Cambridge, according to the company’s app. Barr said the city is prepared to send out Department of Public Works crews to scoop up the Birds if the company doesn’t comply. Either that, or the city could take legal action by getting an injunction, he said. Barr said that during Monday’s meeting Bird representatives didn’t “agree with the legal perspective” the city had, and claimed the company isn’t breaking any laws. But Barr said in order to operate legally in Cambridge, the company first needs to apply for a “Display of Merchandise” permit, which would be granted by the City Council. The council doesn’t meet again until September. Monday’s meeting came after City Manager Louis DePasquale last week sent a letter to Ashwini Chhabra, Bird’s global head of central policy. DePasquale wanted to sit down with company representatives to “explore whether and how Bird might operate” in Cambridge legally. The dockless scooter company showed up unexpectedly July 20 in both Somerville and Cambridge, launching its fleet completely under the radar. Other cities have also been surprised by the arrival of Bird. Barr said the city would like to discuss rolling out Bird as a pilot project, but reiterated the proper legal steps need to be taken first. Until then, the company has been put on notice. Somerville on Tuesday also made the decision to take action against the scooters. City spokeswoman Jackie Rossetti said officials sent the California-based company a formal “cease and desist” letter, which cited Bird’s lack of a license “or any other authorization” to operate on the streets. The letter, dated July 31 and signed by the city solicitor, warned Bird that it has 48 hours to clear out the scooters. Rossetti said in a statement that Somerville officials will “be working on a policy and procurement framework” to invite formal proposals from potential scooter vendors that hope to operate there.